Attention fashionable jet-setters! Summer time means travel time right? But, before taking the flight to your much-awaited beach vacation, you might want to purchase a stylish and highly-functional luggage first. Good news because Kipling Yubin 55 is now available at P3000! 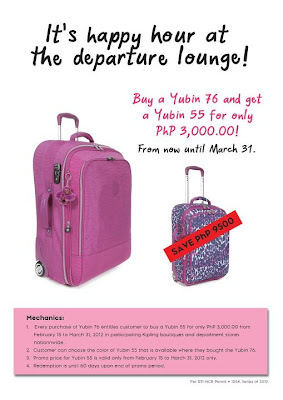 To avail of this promo, you have to buy a Kipling Yubin 76 extra large expandable trolley bag from now until March 31, 2012. Yes, you got it right. Get a Kipling Yubin 55 cabin-size luggage at 75% slashed the original price when you buy a Kipling Yubin 76 extra large bag. Isn't that amazing? So, what are you waiting for? Visit the nearest Kipling store near you and take an ownership of that pink expandable trolley then get another pink lightweight luggage for P3000 only. Kipling is available in the following branches nationwide. To learn more about this promo, visit Kipling Philippines on Facebook. cute bag!! :) wow that's alot of savings! I know. Haha! You have to really want it in order to buy it!! Thanks dear. Will visit back soon! fashionable bag like yubin from kipling is definitely a necessity for fashionista travellers. great find! I want to have them all now. Looks very chic and fashionable!